World Premiere of Live-Action Attack on Titan Movie Set for L.A.’s Egyptian Theater! On July 14th, FUNimation will stage the world premiere of the live-action movie Attack on Titan at Los Angeles’ famed Egyptian Theater. In the run up to the world premiere, Attack on Titan” director Shinji Higuchi will be making a special appearance at San Diego Comic-Con for an autograph session at the FUNimation booth. The company will also host the film in Los Angeles – and has distribution rights for the Americas. FLOWER MOUND, TEXAS – June 29, 2015. FUNimation Entertainment is proud to announce today its distribution of the theatrical, home entertainment, video on demand and broadcast rights to the upcoming Japanese live-action feature film “Attack on Titan” across the Americas (North America, Central America and South America). The film will be released by Toho Co. Ltd. in two parts in Japan on August 1 and September 19, 2015. Series creator Hajime Isayama worked directly with the film’s producers to create the screen adaptation. 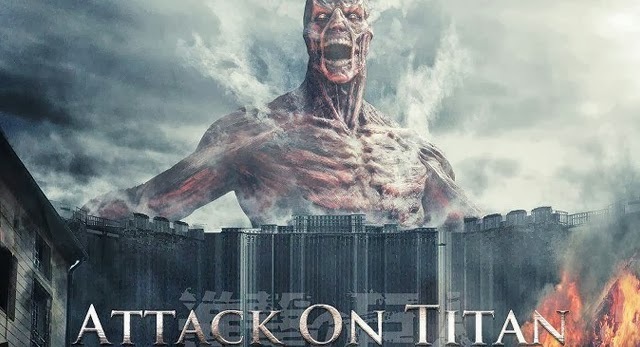 “Attack on Titan” is based on the popular manga series of the same name (“Shingeki no Kyojin” in Japanese), which tells the story of a world where most of humanity has been destroyed by giants and where the last of mankind fights to survive behind three concentric walls – walls that were once impenetrable to the giants. With more than 50 million copies in print today, “Attack on Titan” has also inspired four spin-off manga as well as a 25-episode anime series which FUNimation both simulcast and released to home video in North America. “Attack on Titan” director Shinji Higuchi will be making a special appearance at San Diego Comic-Con (SDCC) for an autograph session with fans on Sunday, July 12, at 1:00 p.m. PST at FUNimation’s booth (#4135). Following SDCC, FUNimation Entertainment and Toho Co. Ltd. will host the world premiere of “Attack on Titan” (Part 1; in Japanese w/ English subtitles) at the Egyptian Theatre in Los Angeles, CA on Tuesday, July 14. The SDCC special appearance and premiere are being held to promote the August 1 release of part 1 of the film in Japan and will include a red carpet event featuring special guests – Haruma Miura and Kiko Mizuhara, who portray Eren and Mikasa in the movie respectively, along with director Shinji Higuchi. Invited guests to the premiere, including celebrities and media, will be among the first in the world to see “Attack on Titan.” A limited number of tickets will be available to fans via FUNimation’s social channels. Like us on Facebook at www.facebook.com/funimation and follow us on Twitter at www.twitter.com/funimation. FUNimation® Entertainment is the leading anime company in North America. FUNimation has a proven formula for launching and advancing brands. They manage a full spectrum of rights for most of their brands including broadcasting, licensing, production, Internet, and home video sales and distribution. For more information about FUNimation Entertainment and its brands, visit www.funimation.com . Previous PostBest Teaser of Year: WGN America’s Prime Crime – Elementary and Person of Interest!Next PostHeart-rending Trailer: Secrets In Their Eyes! Pingback: Dragon Ball Z: Resurrection 'F' and Attack on Titan Live-Action Premiere - ? YATTA-TACHI ?